John Galt kohteessa Brno, Tšekki: Varaa nyt! John Galt is situated in the center of the South Moravia, in Brno. 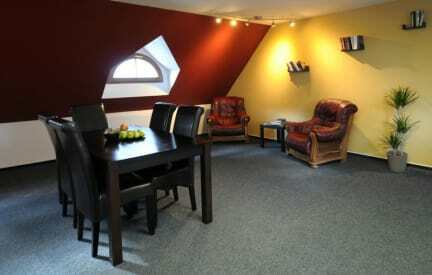 Our little but homely hostel will make your staying comfortable. Also you can use a free WiFi, rent a bike to make a trip around the city. Our staff will help you in any situation: they can suggest you a place to make a currency exchange, they can tell you about the best restaurants of national food, and a place where you can drink a tasty beer. In the common room you can borrow some book or magazine to read, play board games. You can also use our computer in case you don't have your own one. Fully-equipped kitchen is always available for our guests. We are open 9:00 - 22:00 every day. 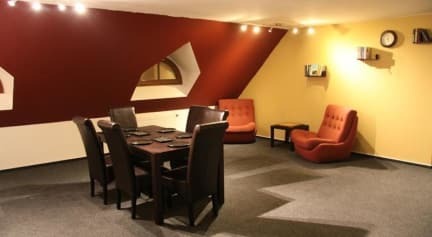 Our hostel is located in a historic building in the heart of Brno, 100 m from the bus station «AN Grand» and in a five-minute way from the Freedom Square. Perfect location on a quiet street, within walking distance of all the main attractions, pubs and shops, can help you to save time and spend a great vacation in Brno. You can have a night in 10-person room and in 4-person room. Tasty breakfast is included in the price. Linen and towels are included. There is a free WiFi connection in the whole hostel. Payment upon arrival by cash, credit cards, debit cards (Visa, Master Card). Check in from 14:00 to 21:55 . Please inform us about a late check-in in advance, then reception can wait for you. Reception times: 09:00 - 22:00.